Purchasing a phone system for your company can be one of the most vital choices you can make. The phone is still considerate one of the most important tools a business can have today, from the way it handles incoming calls by making sure the client reaches you right away and knowing when to send an unwanted solicitor to voicemail. With advances in hybrid phone systems they can now handle intercom between employees, transferring incoming calls, privacy on all lines, and door station with unlocking feature to even adding advertising or music on hold. PBX Phone System have had many advances in the digital market, prices have considerably dropped from recent years while features have sworn through the roof. Digital systems can handle muilti-wireless handsets with multiple antennas, remote programming, day/night/lunch mode and a ton of other features. HOSTED VOIP is an inexpensive and simple solution that puts you in full control. The IP-based service requires no capital purchase, reduces costs 20 to 30 percent, and is easy to manage. Hosted VOIP decreases the need for expensive IT outsourcing while providing your business with a reliable, economical and powerful alternative to your current phone system. 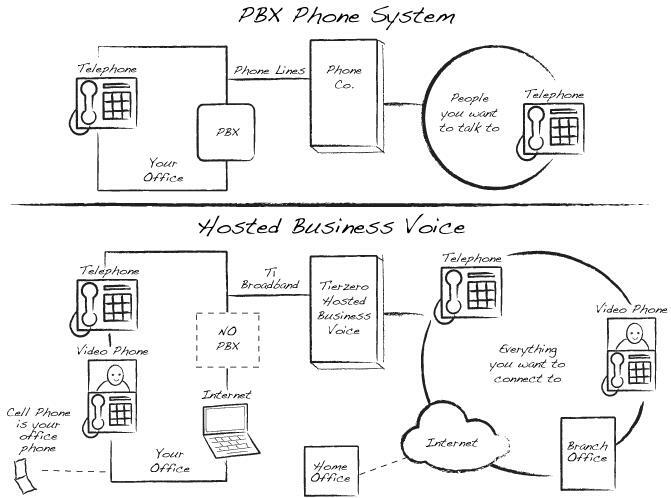 Put Hosted VOIP to work for your business. Whether you are starting your business, relocating you're existing business or in need of upgrade for expansion make sure to speak with one of our trained sales professionals so we can guide you in the right direction and help you explore all options to avoid costly mistakes. Click here to request more information.